thank you again for getting the chairs to us in time for them to be under the christmas tree. my boys just love them...have a wonderful new year. Everything worked out yesterday with my loftbed delivery. Raoul, the driver, was a sweetheart and called me to let me know his nearing arrival. He was courteous, respectful, and responsible. Thank you for all of your help and support too. My experience dealing with your company has been a really good one thus far. Our bunks arrived a week or so ago--wanted to thank you for all your help ordering. The bunks are just what we were looking for!. I purchased the Hideaway Guest Bed (Bed in a Box) from ABC Homestore. The ibed is very comfortable for short stays--far better then any air mattress I have ever bought. The best feature is the way it folds neatly in half and is only 5.5 inches high so it fits nicely under my bed for storage. Very valuable if you live in limited apartment space as I do. I highly recommend this product. This is my 15 year old daughters bed she got it for her birthday and she absolutely loves it,she said best present ever. I found a link to your website on Amazon.com searching for lofts. I have a son, 15 who wanted a loft this year, 5 ft.-11 In. tall and about 180 lbs I searched all over the place and found your website with the only appropriate loft. My son and I put together the loft today Christmas day in about 3 hours. We are both very happy with how it went and he is sleeping in it now. We put together the Manhattan loft with the side ladder addition. Very well laid out directions, everything was included, fast shipping, what else can I say? Definitely would order from Abchomestore.com again! Thank you!! 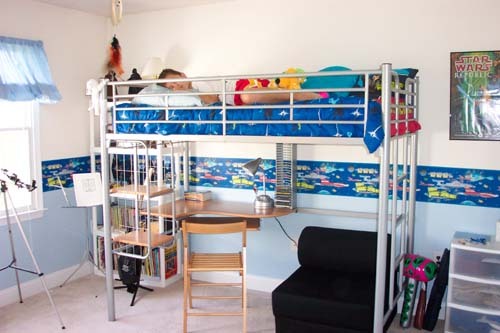 My husband and I recently purchased a full size loft bed for our son, who is a sophomore in high school. I just wanted to take a minute to thank you for your kind customer service, prompt shipping and the overall satisfaction of the bed. Since we transformed his room from a little boys room, into a cool hangout, his room is now where friends, family and the family black lab wants to be. Again, your helpfulness was much appreciated in set up, finding the right size and finishing it. I am enclosing a few pictures of a teenage boys dream room! Thank you and have a wonderful day! Thank you so much! I have found your companies customer service to be excellant! I will certainly be ordering from your store again... in fact I already have a few items on my wish list. Thanks again for taking the time to answer! When I phoned in last week, the woman that answered was very helpful also. I'm not sure if it was you or someone else or you, but just wanted to say thanks about that too! Hope you get this ok and this is customer service email. Just wanted to say I got my desk as schdeuled on Monday July 18th. It is now put together. I am impressed at how well it was packed. Was in a wood frame and in a box. With each part carefully wrapped. The instructions were easy to follow. No words just pictures. Only thing I did wrong was put the far right panel on wrong side and one of the locking wheels in wrong place. But was able to correct those with no problem. All the screws went in nicely. My desk meets my needs. I have a 20 inch monitor, a printer, a shelf for my scanner and a spot for my harddrive. Sorry this is little long, but very satisfied with my order and customer service. I just wanted to thank you for the prompt and courteous service you provided to resolve the situation. I do appreciate a company who thinks first of the customer. It is a rare occurrence these days. I am very happy with the results and want to thank you again for enabling me to provide my grandsons with a good night's sleep. Hope your holidays are happy. I can't thank you enough. My purchase arrived last Friday, my Christmas guests places to sleep are all set, and you guys were great! Many thanks for excellent service. I'll be shopping with you again. Jonah, you have no idea how wonderful it has been dealing w/ ABCHomeStore for this rollaway bed and sheets. I have my grandchildren et al coming in on Wed. night after driving at least 8 hours and they will be so tired. Thank you for making all this so stress free. You all are the greatest. Thank you so much. My grandson loves the bed. He wanted a loft bed but was heavy. I am so thankful that I found your company and will order more. I just wanted to send this message to let you know that I purchased the loft bed with the futon chair. My daughter LOVES it!!!! I found your company through amazon.com and have recommended you to my friends. The delivery service you use was fantastic! They accommodated my schedule and the delivery guy was an absolute jewel!! In this day and age, it is hard to find really good customer service. I found your company to be top notch! Thank you! Our boys just love their bed and you have been great to work with! I was looking for a loft bed that was able to stand over an existing twin bed that was not a peice of junk. I found your heavy duty bed online and ordered. I was expecting problems with quality, time of shipping delays and a poor experience. I was completely wrong. Service tech called the next day to confirm shipping location as I am from Saskatchewan, Canada. Product showed up in 10 days and is perfect. I would buy from you again. I just ordered the Dirty Oak 3-piece Bistro Dining Set ( Item # 5939). Delivery was as promised, but the manner and care in which it was packed was extraordinary! It was very simple to assemble, even for me, a senior citizen with some dexterity problems. The quality of this item far exceeds what you might expect just from the pictures on the website. I would highly recommend ordering from this company . Customer service and quality of it's merchandise speaks for itself. Thank you- it has been a pleasure doing business with you; I'm going to spread the word to family and friends re: your website. I just HAVE to tell you..I have been purchasing quite a few large items for my new house and the breakfast set I got...well....NOTHING has ever come so well packaged and protected as that set! I am so impressed with your shipping and service and I thank you VERY much! I ordered a set of bunkbeds late on a Wednesday night, and they arrived in only 5 business days! The beds are FAR MORE beautiful than I expected for the super low price. I shopped local furniture stores as well as many on-line stores, and none could beat ABC s price. The bed was superbly packed. Each piece was wrapped in plastic and enclosed in a CRATE! These beds are EXACTLY what I was looking for. Although I was a little skeptical about ordering from a company I knew so little about, I could not be more pleased. This is a store that delivers what it promises. Place your order; you will not be disappointed! What an excellent transaction!!!! Loft bed was assembled in the warehouse of the office I work in and 2 co-workers have asked for the name of the company I purchased it from. I am highly impressed with the level of service, the price and the quality. Please be advised that we have received our order and are very pleased with the quality and workmanship. Thank you for your prompt and courteous service. I ordered two loft beds. I called to ask a question first and my question was answered quickly and easily and she was super nice. I received the beds so quickly that I had to rush to make room for the UPS man to deliver them! I was thrilled with the quality and the detailed instructions. The beds were very easy to put together and my sons LOVE them. They are sturdy and look great. Thank you! Just wanted you to know the bed arrived on time. It is a well made excellent product and we are extremely happy with it. Thanks again for shipping it out a day earlier than expected.. I'm truly pleased with the tables. They arrived much soon than anticipated They were the same as shown in the pictures. Came crated well to prevent any damage. the Customer service rep called to confirm the order and was friendly and knowledgeable. She answered all my questions, as I have never ordered furniture online before. I would highly recommend ABC Home Store and I will definitely buy from them again. Thank you. I received my item the very next day. It looks great and I am sure I will put it to good use. Just wanted to say thanks for getting us the loft bed quickly and to let you know that we really like the quality of the bed and the ease of putting it together. It even comes with a little bottle of touch up paint! Will look forward to shopping with you again,. I received the loft bed and I love it!!!! Thank you so much!! I put it together today and I can't wait for my son to see it when he arrives home from school. Thank you again. I am very happy with your product. I ordered storage wardrobes last TUESDAY. Someone called me that same afternoon to tell me my color choice was not available and offered me alternatives. The products arrived THURSDAY despite the fact that Wednesday was a holiday I was very happy with the products themselves --- but your service was extraordinary. I will recommend this site to anyone and everyone who will listen. It is a nice change of pace to receive excellent service. Keep up the good work. Kudos. Just wanted to let you know, we're very happy with both products, the trestle table with benches, and the valet. We've ordered from other online furniture sites and have come to expect less than promised, but with your site, it is just the opposite: you get more than you hoped for! We'll definitely be ordering from your site again. Thanks. I just want to tell you we have finished putting the beds together. The boys just love it. I was impressed with how well made they were and the instructions were easy to understand. Thanks again for all your help. Great service and fast shipping! Many great products to choose from. Really loved the product. The roll-away bed is so sturdy and well made. Best service and would definitely shop here again in the future. I just wanted to say that I am very pleased with not only your high level of customer service, super-fast delivery, but also with the item, a 5-piece dinette set, which I purchased recently from your website. I will definitely consider buying from your company again! Thank you! Thank you! I picked up the table and chairs this morning. It was very nice to meet you and the workers were great in helping me load my p/u truck. Hello ABC store - just wanted to let you know how pleased I am with your service, your shipping service, the truck driver, and the product. Everything was on time and in good order. The bed is just what we wanted (it's hard to tell, sometimes, just looking at it on the computer). It is well built and very sturdy. Thanks again for a good product, and good service. Praise : Product as advertised, quick shipment A+ markob69 Praise : Fast shipping, product as described, and great quality. thank you for the fast delivery on my order..i love the cocktail table set...have ordered from you before and will order again again....thanks Dina. I received the dinette set yesterday, and I even had it assembled in time to eat dinner on it! Thanks. We like it a lot. Thank you so much for helping us with the bunkbed purchase, my girls love it. Yesterday I spoke with Mr. Jonah regarding the status of an order I placed for a NY rollaway bed. Jonah found my order and—much to my amazement—the bed arrived today. I am so pleased with this level of service and I feel compelled to tell you that you even in Texas you have a wonderful reputation!